The royal baby has been born! The Prince of Cambridge (as the baby will officially be called) is third in line for the British throne after his grandfather and father. the use of the word ‘we’ to mean ‘I’ by a king or queen, especially in the past. People usually laugh at someone who does this, because it shows they think they are important. -Of course, owning a car in London is a royal pain. -Getting a home PV system grid connected is a royal pain and can cost a significant proportion of the total cost. -Entering your phone numbers manually is a right royal pain in the neck. This shows up even more clearly with the adverb: you can be royally entertained or looked after – but also ‘royally screwed’, ‘royally abused’, ‘royally shafted’, and ‘royally soaked’. Perhaps choosing George for a first name will inspire our Georges to take an interest in English! Hopefully the Royal baby ‘mania’ will take a more normal turn in the future. I have also heard of ‘a right royal mess’, in which ‘royal’ is an intensive. Loved it. Sooooo helpuful for my classes. Tanx, kisses. Hello Michael Rundell – by reading the sentences you extraced from the dictionary it seems that “royally” works as a synonim for “highly”, “mighty”, “totally”. I did not search around but I thought of an hypothesis: it borrows from the idea of the “highness” treatment given to royal people. The concept, therefore, would be that everything “Her Highness” does is “high” or “mighty” (see, for example, “royal pain”). Hence if, say, a peasant was abused by “His highness” he was “highly” abused indeed. 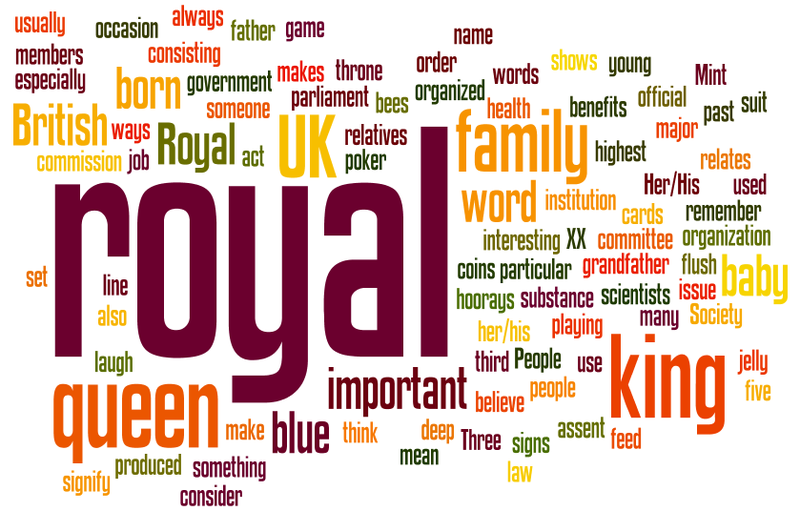 The adverb “royally” is the one who can sum up all of these nuances into a single word… what do you think? That’s exactly what I was looking for. Thank you!